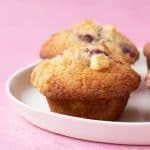 Soft bakery-style muffins filled to the brim with raspberries and white chocolate. Preheat your oven 200 C (400 F). Grease a 12-hole muffin pan well with butter or olive oil spray. In a large mixing bowl, add flour, baking powder and sugar and whisk briefly. To a small bowl, add oil, vanilla and eggs whisk briefly just break up the egg yolks. Make a well in the middle of your dry ingredients, add the wet ingredients, along with the buttermilk. Very gently fold the mixture using a wooden spoon. Add raspberries and white chocolate pieces. Fold until the mixture is just combined – be careful not to over mix or your muffins will be tough. Spoon out the mixture into your prepared tin. Bake for 5 minutes before turning down the heat to 180 C (360 F) and bake for a further 13-15 minutes or golden brown on top and a skewer inserted into the middle comes out clean. *You can use fresh raspberries if you like.